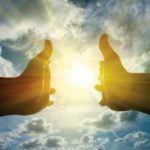 People in the West may perhaps find this year’s commemorations marking the end of World War II a little disorientating, especially in light of the current Ukraine crisis. These deaths at the hands of Western-backed fascist forces attempting to strangle Ukraine come in the same week that the world is celebrating the defeat of the very same fascist forces 69 years ago. But, unbeknownst to many in the Western public, the present situation in Ukraine is not a curious contradiction; it is a consistent geo-strategic policy of Western aggression towards Russia. 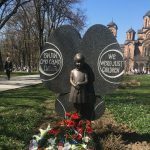 This year, as in every year, the Second World War commemorations pay homage to the millions who died in the struggle to defeat European fascism, in particular the defeat of Nazi Germany, which from the late 1930s until 1945 embarked on aggressive conquest of other countries and a program of mass extermination. The sacrifice of many Western soldiers and citizens is not doubted; but what needs to be examined is the real motivations of the Western rulers preceding the Second World War, during it and afterwards, and up to the very present day. Pitted against Hitler’s Germany and the fascist Axis Powers were apparently the Allied forces of the US, Britain and the Soviet Union. Yet this year, we see a seemingly curious contradiction. 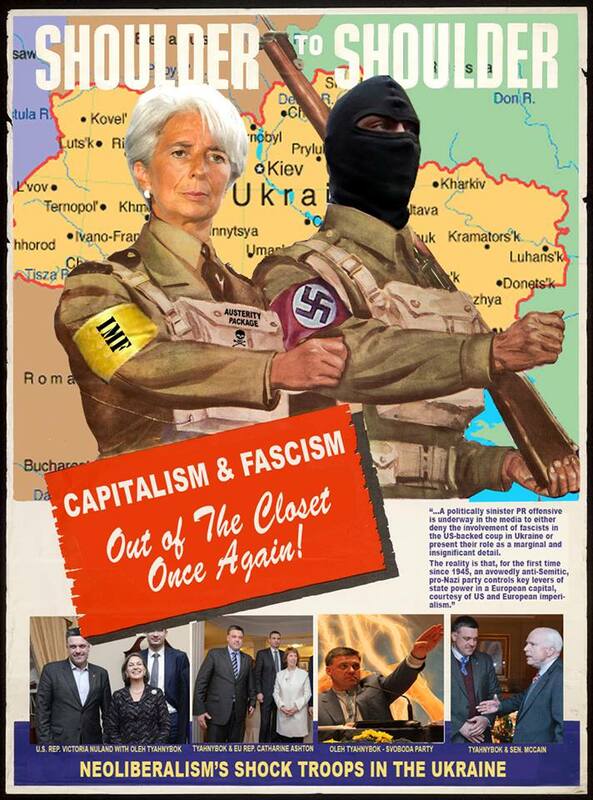 The US, Britain and other Western allies have emerged as allies to the revival of Nazism in Ukraine. The regime that the Western powers helped to illegally install in Kiev in February earlier this year, by covert CIA-sponsored murderous street agitation, are the self-proclaimed heirs to the legacy of former Ukrainian fascists who collaborated with Nazi Germany in its attempted conquest of Russia, beginning in June 1941 with Operation Barbarossa. The present-day Svoboda party and its ministers in the Kiev self-declared government proudly trace their political lineage to the Organization of Ukrainian Nationalists led by arch Nazi collaborator Stepan Bandera. Bandera and his cohorts participated along with the Wehrmacht’s Einsatzgruppen SS in the mass murder of millions of Jews, Poles, Russians and others. That collaboration paved the way for the Nazi war machine to reach within 30 kilometres of the gates of Moscow in late 1941. 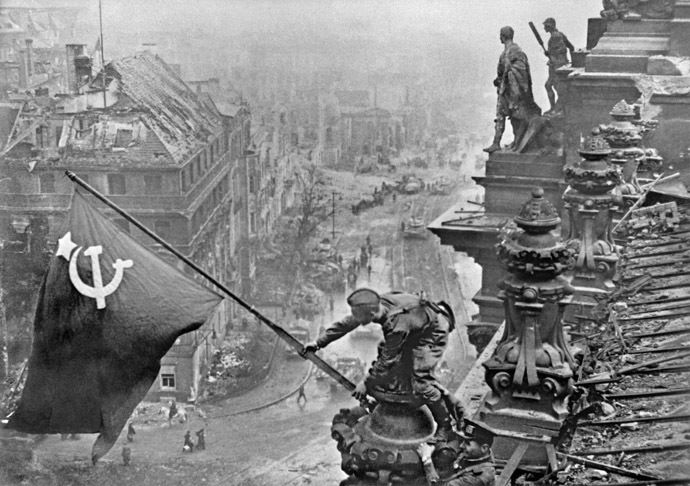 The heroism and massive sacrifice of the Red Army and the Russian people gradually led to the reversal of the Nazi war machine all the way back to Berlin and its eventual defeat during this week 69 years ago, on May 9, 1945. Russia’s place of honour in the international war commemorations this week, as in every year, is undisputed and indisputable. It was the Red Army that defeated Nazi Germany. Up to 14 million of the Russian soldiers (and as many civilians – OR) gave their lives in the historic fight, compared with some 400,000 each of British and American military. Out of the apparent three war allies, it was Russia that bore the brunt of Nazi German aggression and it was Russia that inflicted the eventual historic defeat. Some 90 per cent of all German military losses in the entire war were incurred on its Eastern Front against the Soviet Union. Bear in mind, too, that the Americans and British did not launch their European offensive against Nazi Germany until the summer of 1944, despite several appeals from the Soviet leader, Josef Stalin, for the Western allies to join the struggle sooner and thus alleviate Russia. Total deaths, both civilian and military, from World War II are put at 60 million, occurring across 30 countries. Of this total, some 30 million were suffered by Russia and its Soviet allies. There is thus no doubt as to the eminent place accorded to Russia in the heroic defeat of European fascism. 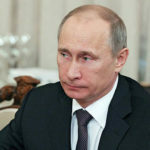 This is why, despite the ongoing East-West tensions over Ukraine, the French President, Francois Hollande, this week renewed an invitation to Russian leader Vladimir Putin to attend the 70th anniversary of the D-Day landings in Normandy scheduled for next month. That event will be also be attended by US President Barack Obama, German Chancellor Angela Merkel and Britain’s head of state, Queen Elizabeth II. Well, of course, Putin should be present because, as noted, it was Russia that actually won the war – and these Western powers know that. For Putin to be absent, out of churlish Western exclusion, would make the spectacle farcical. Imagine it. France, whose Vichy regime collaborated with the Nazis, is to hold an event marking the defeat of Nazi Germany, and yet the war’s real victor, Russia, were to be absent. The 90 per cent military losses incurred by Nazi Germany on its Eastern Front with the Soviet Union is an important corrective perspective to Western hubris. Both the US and Britain entertain vain notions that they won the war. Think of the number of Hollywood films that reflect the popular notion in the West that it was the heroics of America and Britain that «liberated Europe». But there is another salutary lesson from the disproportionate destruction suffered by Russia during the Second World War. This aspect has been virtually suppressed in Western history books because of its shocking truth about the real cause and motivating logic of the war. A proper understanding of WWII also exposes Western hubris about its supposed noble role in defeating Nazi Germany as completely fraudulent. 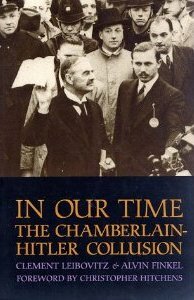 In their book, The Hitler Chamberlain Collusion, Alvin Finkel and Clement Leibovitz, show that the Nazi war machine was covertly and deliberately built up with the help of Western ruling classes during the 1930s. US corporate investment in Hitler’s Germany between 1929 and 1940 grew faster than in any other European country, thus ensuring, in part, the massive industrial rearmament of the Third Reich – despite prohibitions under the Versailles Treaty signed at the end of First World War in 1918. The British ruling class was particularly instrumental in Hitler’s aggrandizement of power. When the Fuhrer remilitarized the Rhineland during 1936, Britain turned a blind eye. The British ruling Conservative Party led by Prime Minister Neville Chamberlain held a series of secret meetings with Hitler and the Nazi leadership during 1937 and 1938, culminating in the Munich Declaration in September 1938. 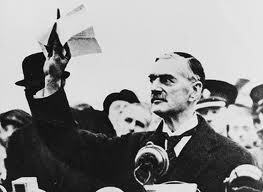 When Chamberlain returned to Britain waving a piece of paper and declaring «peace in our time»  he was, and still is, widely accused of «appeasement». 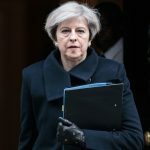 But, as Finkel and Leibovitz documented from their examination of the covert British-German official correspondence, the policy of London was not appeasement but rather collusion with Nazi Germany. 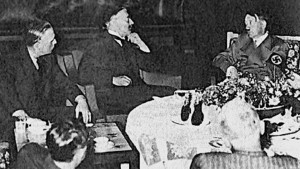 In an earlier clandestine meeting in Godesberg, on 23 September 1938, Hitler told Chamberlain «there should be no conflict between us». The Fuhrer viewed Britain and Germany as «the two pillars of European social order». The British Prime Minister, his Foreign Secretary Lord Halifax and other senior members of the London government told Hitler that his «powerful force of nationalism and racialism» was much appreciated. Why? We have to understand the rise of Nazi Germany and other European fascist regimes – Mussolini in Italy, Franco in Spain and Salazar in Portugal – in its historical context. 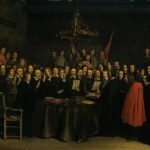 In particular, the Russian Revolution of 1917 heralding the emancipation of workers and the expropriation of capitalist power had earth-shattering repercussions for the ruling class in all Western capitalist countries. In addition to racist ideology of «master race» and «Untermenschen», the European fascists were deeply hostile to Communism and the Soviet Union in particular – despite Hitler’s movement calling itself «national socialism». Hitler personally loathed Marxism to a pathological level, as did all the leadership of the Third Reich. It was this rabid anti-Communism of the Nazis that appealed most crucially to the Western capitalist rulers. Hitler was viewed as a strategic bulwark against the spread of Communist revolution at a time when capitalism was in deep crisis from the Great Depression and widespread poverty in Western countries. The collusion between Chamberlain and Hitler was a secret pact that reflected the geo-strategic anxieties of the American and British ruling classes. The Nazi war machine was hence to be built up and aimed at destroying the Soviet Union. This is what really lay behind the apparent British appeasement of Nazi Germany. The policy was designed to give Hitler’s Germany a «free hand» to expand eastwards. That is why Britain did not object to Hitler’s annexation of Austria and the Czech Sudetenland during 1938. The British rulers had explicitly, but secretly, agreed to give Hitler a «free hand» to «uphold the European social order» of capitalism over the potential rise of Russian-inspired Socialism. In effect, Hitler’s Nazi Germany was essentially a client regime of the Anglo-American capitalist axis, just as the other European fascist regimes were too. This explains why the Nazi war machine directed its massive firepower towards the Soviet Union, where the worst diabolical excesses of «Untermenschen» extermination were to be carried out. Hitler was doing what he was expected to do by the Western ruling classes that had helped bring him to power owing to his rabid anti-Soviet ideology. The barbaric suffering inflicted on Russian and other Slav populations is on a different scale to what the Third Reich committed in Western Europe or towards British and American prisoners of war. As in all Western power-client relations, the nexus is subject to changing tactical calculations. For instance, the US and Britain fomented and sponsored Iraq’s Saddam Hussein during the 1970s and 80s in order to wage war against Iran, only for the Western powers to turn against the Iraqi dictator subsequently when he became a regional threat to their interests. Ironically, the oft-superficial comparison by Western imperialists between Hitler and Saddam, to justify the Western war on Iraq during the 1990s and 2000s, is at a deeper level very apposite. The Western imperial powers were, in both cases, merely taking down a dictator of their own creation for expedient, cynical reasons that mutated over time. Likewise, Hitler’s expansionism beyond the tacit remit of destroying the Soviet Union turned his Western patrons against him. Thus, ironically, the Western powers entered an expedient «alliance» with Soviet Russia to defeat Nazi Germany even though the latter had been fomented in order to destroy the former. However, as noted above, the wartime alliance was marked by Western ambivalence. 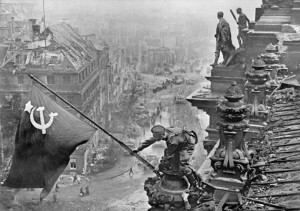 Russia was permitted to soak up German aggression for three years before the West finally launched troops into Europe, and that move was probably hastened because the Red Army’s dramatic gains against the retreating Wehrmacht threatened to give Stalin conquest of all of Germany and other Central European territories. The underlying strategic imperative for the capitalist West in 1945 was therefore «reset» to 1917 – when the priority back then was the defeat of the Soviet Union. The Hitler option had been exercised by the Western ruling classes to vanquish the Russian Communist threat – and that option turned out to be a reckless bad bet. In the end, the Nazi anti-Soviet war machine had to be terminated with extreme prejudice for cynical Western geopolitical reasons – reasons that we hear none of in subsequent official Western war commemorations. But at the end of the Second World War the latent geopolitical concerns of the Western capitalist powers remained intact – namely, the continued existence of the Soviet Union and its potential threat to the capitalist world order. Western elite fears were heightened even further because of the prestige that the Soviet Union gained among the Western public, who knew the heroic sacrifices of the Russian people to defeat European fascism. 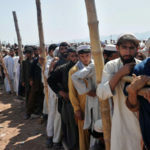 There was also a palpable perception among the Western masses, to some degree, that their ruling classes had indulged in facilitating the rise of fascism. For example, this contempt for the ruling class was why British Conservative leader Winston Churchill (who took over from Chamberlain in 1940) was kicked out of office by the electorate just after the war, and a Socialist Labour government was voted in for the first time. This was in spite of Churchill being portrayed as the doughty war leader. No sooner had the Second World War ended than the British and American ruling classes instigated the Cold War against the Soviet Union. Stalin went from ally to villain in an overnight Western transformation. The nation that defeated murderous European fascism – Russia – was henceforth cast as the enemy, with Western propaganda going into overdrive declaring «the Red Menace» and «Evil Empire». Decades of massive Western public brainwashing instilling fear of Russia and Socialism would ensue. Today, the Russian state may no longer espouse Communism as an official ideology. But nonetheless a strong Russia is still a geo-strategic threat to the order and desired global hegemony of Western capitalism. Russia is seen especially by Washington as an impediment to its expansionism in the Middle East and Pacific. Moscow’s trenchant political support for Syria, for instance, has largely thwarted Washington-led regime change efforts in that country, which in turn has vitiated American ambitions to undermine Iran, another Russian ally. More than 20 years after the official end of the Cold War following the collapse of the Soviet Union, we have witnessed a relentless aggressive expansion by the US-led NATO military alliance towards Russia’s borders. This dynamic is scarcely questioned in official Western discourse. But the answer is profoundly telling. This strategic aggression towards Russia by the American-dominated capitalist West is consistent with how the Western powers viewed Moscow as an enemy to their hegemony back in 1917 following the Bolshevik Revolution. It is consistent with how the Western ruling class enlisted European fascism as a bulwark against the Soviet Union during the 1930s – igniting the worst global conflagration in history. It is consistent with how the former Western allies immediately switched on the Cold War in 1945 that froze the Soviet Union out of normal international relations for nearly half a century. And it is consistent with why Washington and its European capitalist allies are currently pursuing an agenda of aggression towards Russia under President Putin over tortuous allegations and fabrications in the current Ukraine crisis. Above all, the deep, underlying geo-strategic hostility of the Western powers towards Russia is manifest today in the following seemingly absurd contradiction: the 69th anniversary marking the defeat of European fascism is today the occasion for the capitalist Western powers to be in alliance with the neo-Nazis that usurped power in Kiev. The purpose and strategic target, as always, is Western imperialist aggression towards Russia. 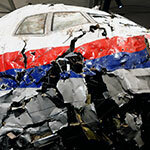 This gives the real meaning to the so-called «reset» in Washington’s relations with Moscow. The Western capitalist powers will ally themselves with any force no matter how depraved and despicable – to further their hegemonic objectives. The little-known alliance between the West and Nazi Germany is of the same essential quality as the present-day Western alliance with neo-Nazis in Ukraine. At a profoundly troubling level, it can be said that the Second World War never really ended for the Western capitalist powers. It was merely paused, restarted with the Cold War, and is today being resumed by the Western capitalist powers against their long-time perceived enemy – Russia. Why did Britain and the United States have no desire to prevent WWII? I appreciate your analysis and mostly agree with you, but for the completeness, I regret that you completely omit to evoke the German-Soviet pact which is the usual western argument for putting Russia on the bad side before being forced to enter in war by the Barbarossa attack. Our comprehensive analysis of the Western diplomatic maneuvers around Poland in early August 1939 that eventually led to the Soviet-German Treaty of Non-aggresion signed on August 23, 1939 will be published soon.